**My Desert Cottage**: Meet my partner!!!! Isn't that anaglipta wall paper to die for!!! 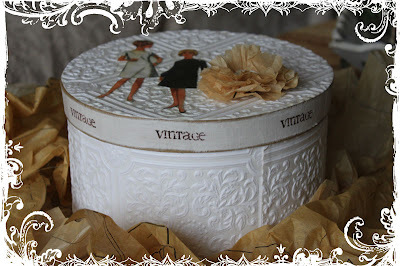 The box is so beautifully covered complete with the sweetest flower made from old clothing patterns. 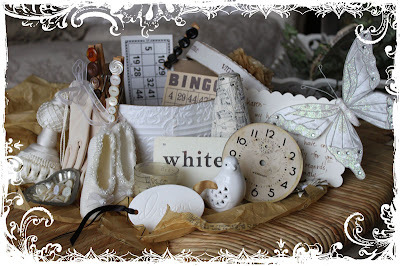 The box was filled with so many wonderful goodies that I have already put to good use! 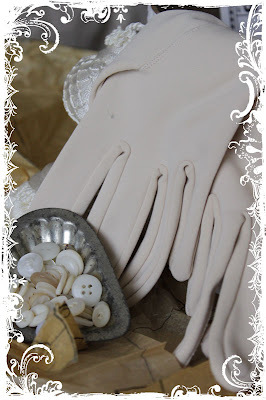 These gloves are fabulous and are already in a vignette in my bedroom. I LOVE this flash card!!! (I know I'm easily pleased) and the clock face tops my new lampshade in the master bedroom. The sweet little bird is also with me in that room. Mary and I had a very interesting phenomenon happen. We were completely on the same wavelength when it came to our goodies. We both sent each other a heart filled with buttons. 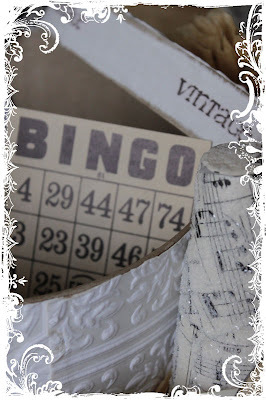 We both used paper patterns as wrapping paper, and we both sent vintage ephemera. Mary was the perfect swap partner!!!! If you want to see what I sent Mary then click here. And If you want to see all the wonderful boxes that were shipped all over the country hop over to see Cathy for the list of all the participants. karen - your photos are just excellent. 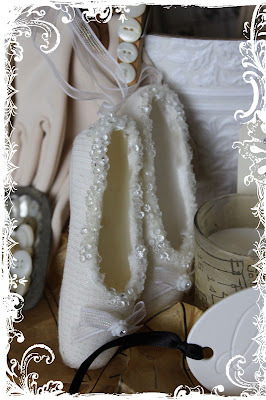 and i'm smiling again - because our posts are so similar:) what a wonderful swap it was! Oh my goodness this is stunning! This was such a fun swap. Thanks for posting. I just love your blog and will be back often. Beautiful items, Karen! 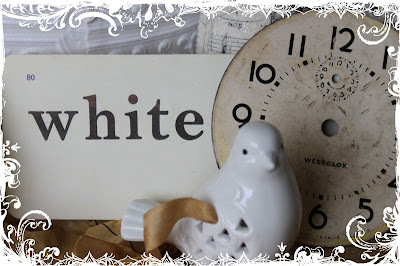 Love the white theme, too! It seems like everyone had a great time giving and receiving in this swap. Everything is simply beautiful. Happy Birthday today!!! Lovely and it just seems to fit you, sugar. I love them. Wish I had entered now but other things prevented it. Next time, next time! Hah. Ahhhh! Beautiful, calming and lovely! I'm wishing you the sweetest birthday today. Oh my gosh Karen! The white theme is awesome and so beautiful! Happy Birthday . . . Happy Valentine's Day . . . and ooooh what a happy MAIL DAY you had!! 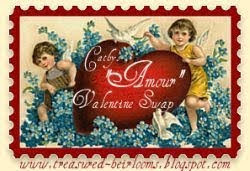 I am so happy your swap partner got to know you. And I see you got to know her very well too. Two happy customers! That's the ticket. Thank you for joining in my first swap and helping me make it a huge success. Enjoy your treasures my friend. Happy Birthday, Karen! Hope you have a wonderful day!! Oh what lovely whites! I really have enjoyed seeing all the white ones today! This swap has been fun!! This Amour Swap has been so much fun. Besides my package, yours and Mary's are both my absolute favorites - I love these goodies! 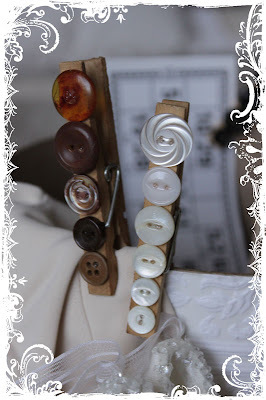 The button clothespins and ballet slippers, and the WHITE flashcard - I love them all! WOW!!! what a gorgeous bunch of goodies, beautiful swap. I love everything you made for your partner! Those little tickets are precious. Happy Valentines Day! What lovely things you received. And I love the way you posted your photos! This was really a lot of fun! O my gosh!, the two boxes seem to be done by the same hands! And the filling too! Congratulations, you choose a wrote by Francesco Guicciardini, a florentine such as me! I so enjoyed your photos! I have to agree after checking both posts, you were assigned the perfect partner. Don't you love serendipity? How much fun is this!? Darling swap box and goodies! You and Mary were the perfect match! Jessica at Kids Napping? I'm Scrapping? Oh such lovely gifts!!! Love all the whites. Thanks for sharing! These pieces look as though you sent them...you must have been so happy to see all of these fabulous goodies coming for you! You guys were really on the same page!! Fabulous swap....I know you are hooked now!! You received so many pretty items! I love all of the whites! This swap has been so much fun! Thank you for sharing!